There are nearly 200 distinct countries in the world. Collectively they represent a disparate range of political institutions, economic systems, natural resource investments, special-interest groups, and financial cash flows. Essentially, because of this range of competing interests, it is not surprising that corruption exists, as governments and corporations succumb to the temptation to channel resources as they see fit. This is further compounded as countries seek to address major issues like economic recessions, poverty, educational reform, climate change, and so forth, allowing a concentrated group of individuals to have access to vast amounts of money. Simply put: bad people in power are often able to do illegal things for personal gain. Every year, the non-governmental organization Transparency International publishes the Corruption Perceptions Index (CPI). 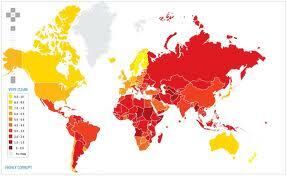 This annual report measures the perceived levels of corruption in the public sector in over 170 countries. Of course, because the very nature of corruption implies covert actions behind the scenes, corruption itself is difficult to measure; for that reason, the CPI measures through the perceptions of third party individuals and companies. Admittedly, this report is not perfect, but it is certainly the most accurate measurement we can use in assessing the level of world-wide corruption. The 2010 CPI measured 178 countries on a political and corporate corruption scale of 0 (highly corrupt) to 10 (highly clean). The sobering result? Nearly 75% of the countries weighed in at less than 5. Obviously corruption is a global epidemic. On the positive end of the spectrum tied New Zealand, Singapore, and Denmark, barely corrupt at 9.3. Conversely so, Somalia entered in 178th place at 1.1 (View the full report). Sadly enough, Somalia is not alone in this grave position, being accompanied by Myanmar, the Sudan, Afghanistan, and over a hundred others. Even our own country, the United States, comes in at 7.7—certainly not free of corruption by any standards. Without a doubt, countries around the world are in need of “corruption accountability”, more commonly referred to as “transparency.” Lobbyists, non-governmental organizations, and private think tanks are well aware of this problem. In the past 20 years, we have seen a surge of research and initiatives designed to promote transparency in political and business processes. The most well-known of these is the previously mentioned Transparency International, which in addition to publishing the CPI, also actively promotes transparent activities and corruption exposure through the building of bi-partisan anti-corruption groups. This organization is doing ground-breaking, world-changing work; it is certainly an organization whose efforts we should track. Moreover, transparency is a relatively new and cutting-edge field of study, one which Christians must champion. Its philosophical roots include a desire to limit evil and promote justice, two concepts that are fundamentally Biblical in nature. Throughout the Bible, both Old and New Testaments, we receive admonitions to end corruption, defend the oppressed, establish justice, and spread truth. These concepts are all at the root of the Transparency movement, telling me that God must have something to say on this subject. As Christians, I would suggest that we need to take an active interest in assessing government interests and identifying potential areas of corruption. Overall, we must always bear in mind that all sin will eventually be exposed to the light—how much better would it be to actively counter corruption in our own day and seek to promote transparency? We cannot bury our heads in the sand and assume that someone else will address the problem. In my mind, the transparency movement should be headed by the body of Christ, not a secular organization. Justice and truth are God’s victories, not man’s, and we must do our part to claim that victory as such. Speaking as a traveler here in East Africa, I can testify to the damage that corruption does to the people of a nation. Kenya in particular has huge problems with corruption- from bribes and graft at the highest levels, to corruption in the police force, and nepotism connected to the tribal systems. At the most fundamental level, this ruins a country because there is no trust- when people do not trust that their government will give them justice, there will be more crime, retribution, and racism/tribalism. Rwanda is doing better than its neighbors, thanks I think to the government’s transparency measures designed to attract Western business. Hopefully this continues. I think it’s important to take into the account the “perceived” corruption of a government or agency, not just the “actual” corruption. Corruption is a real problem, but often our psychological archetypes reinforce the problem. In Lima, Perú there was a perception that the police were extremely corrupt. Wether it was true or not, people reinforced the idea and it became self perpetuating. The government then decided to try and fix the problem, and found that people in Lima trusted women officers a lot more than men officers. They proceeded to add all women police groups to their force, and people’s perceptions of the law officers started to change. Which I thought it was an interesting solution worth sharing. Hopefully we can find ways to encourage transparency and innovative solutions in countries where there is a lot of corruption.